In Part 1 and Part 2 of this series, we covered the basics of Prometheus metrics and labels. This third part will concentrate on the way Prometheus collects metrics and how clients expose them. Metrics collection with Prometheus relies on the pull model, meaning that Prometheus is responsible for getting metrics (scraping) from the services that it monitors. This is diametrically opposed from other tools like Graphite, which are passively waiting on clients to push their metrics to a known server. Moving this responsibility to the server relieves the clients from a lot of the workload. 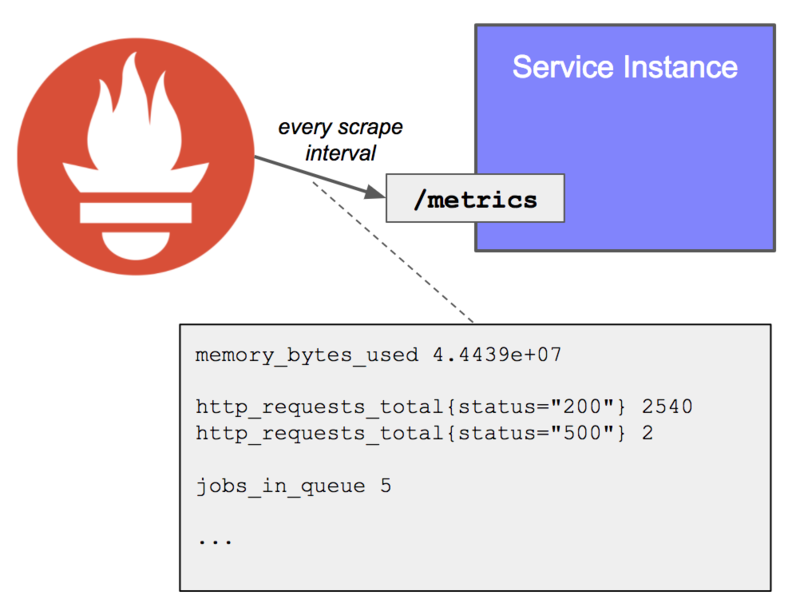 Instrumented services only have to expose metrics in a way a Prometheus server can read them and doesn’t need to worry about where the Prometheus server is (or if there is any at all). Additionally, instrumenting a service is relatively cheap on the client side, as Prometheus does all the heavy lifting for complex calculations (see Histograms mentioned in Part 2). Finally, if the Prometheus server was ever under pressure, it will throttle the scraping of services itself, as opposed to having clients pushing metrics and bringing down the server. A potential challenge with this model is that Prometheus now needs to know where to collect these metrics. In a microservices architecture, services can be short-lived and their number of instances can vary over time, which means that static configuration is not an option. Fortunately, Prometheus server comes with built-in service discovery solutions and makes it pretty seamless to integrate with a number of platforms and tools, including Kubernetes and Consul. Clients have only one responsibility: make their metrics available for a Prometheus server to scrape. This is done by exposing an HTTP endpoint, usually /metrics, which returns the full list of metrics (with label sets) and their values. This endpoint is very cheap to call as it simply outputs the current value of each metric, without doing any calculation. On the Prometheus server side, each target (statically defined, or dynamically discovered) is scraped at a regular interval (scrape interval). Each scrape reads the /metrics to get the current state of the client metrics, and persists the values in the Prometheus time-series database. In addition to the collected metrics, Prometheus will create an additional one called up, which will be set to 1 if the last scrape is successful, or 0 otherwise. The up metric is incredibly useful to detect crashes. Not everything can be instrumented at the code level. This is where exporters come useful, acting as side-cars to machines or other applications (e.g. databases). The most common one is the node exporter, which can be installed on every machine to read system level metrics (cpu, memory, file system…) and expose them under a /metrics endpoint in the way Prometheus can scrape it. The key of any monitoring tool is its simplicity, especially when it comes to instrumentation. 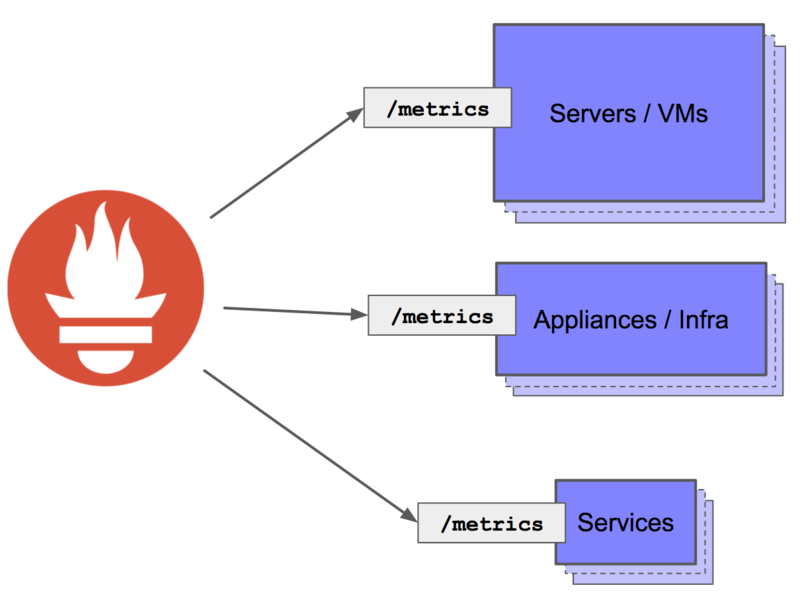 Prometheus shines in that area, making it very easy for clients to expose built-in metrics without having to worry about the Prometheus server (so long as best practices are being followed in terms of label cardinality!). However, built-in metrics only get us some part of the way to observe systems; in the next part, we will be looking at how to instrument Golang and Java applications to add custom metrics. For anybody starting a product today, the idea of deployments requiring downtime is ludicrous. The truth is, a lot of today’s products started their development more than a decade ago, with architectures reflecting a different set of practices and assumptions. Instrumented applications bring in a wealth of information on how they behave. In the previous parts of this blog series, the focus has been mostly on getting applications to expose their metrics and on how to query Prometheus to make sense of these metrics. This exploratory approach is extremely valuable to uncover unknown unknowns, either pro-actively (testing) or reactively (debugging). Metrics can also be used to help with things we already know and care about: instrumenting those things and knowing what is their normal state, then it’s possible to alert on situations that are judged problematic. Prometheus makes this possible through the definition of alerting rules. So far in this Prometheus blog series, we have looked into Prometheus metrics and labels (see Part 1 & 2), as well as how Prometheus integrates in a distributed architecture (see Part 3). In this 4th part, it is time to look at code to create custom instrumentation. Luckily, client libraries make this pretty easy, which is one of the reasons behind Prometheus’ wide adoption. This post will go through examples in Go and Java. Prometheus has a number of other supported languages, through official libraries and community maintained ones. In Part 1 of this series, we talked about Prometheus metrics and how to make good use of labels to observe your applications under different segments and dimensions. This second part will look into more details in the 4 different types of Prometheus metrics: Counters, Gauges, Histograms and Summaries. When it comes to monitoring tools in the last while, Prometheus is definitely hard to miss. It has quickly risen to be top of the class, with overwhelming adoption from the community and integrations with all the major pieces of the Cloud Native puzzle. Throughout this blog series, we will be learning the basics of Prometheus and how Prometheus fits within a service-oriented architecture. This first post the series will cover the main concepts used in Prometheus: metrics and labels. CODE Stockholm is a one-day conference centered on Continuous Delivery and the DevOps movement. Both aspects were well covered through keynotes and two tracks of great talks. As engineers, we tend to have high expectations of product managers to justify the value of adding new features. What problem is this solving? How will we validate that we’re building the right thing? Is this the most important thing to work on right now? These are great questions but interestingly we aren’t always applying the same rigor to the technical work. This talk from RebelCon 2017 gives an overview of different monitoring patterns and how different tools can be used to help build a fuller picture of distributed applications in production. Microservices in a fast-paced customer-centric environment: How and Why? In this talk at TMForumLive 2017, I describe the Poppulo journey (and challenges!) from a single team building a monolithic application to six teams practicing DevOps on a microservices architecture.